Even for someone who reads as much as I do, three or four novels per month for pleasure and again as many for work with Silverthought, and countless short stories and non-fiction on top of that, there once in a while will come along something that feels less like a gentle nudge and more like being hit by a freight train. The last time one of these literary sledgehammers hit me was when I picked up Cormack McCarthy's The Road, and put it down finished five or six hours later after having forgotten that the world existed. That was, I think, 2006-ish, and five years later it's happened again. The book this time? 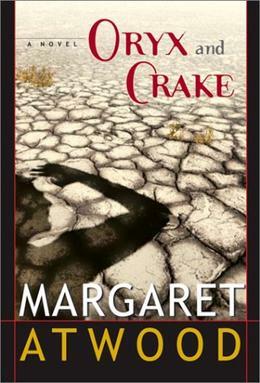 Margaret Atwood's 2003 spec-fi masterpiece Oryx and Crake. This was one of those experiences that my friends and I talk about from time to time where we pick something up once, twice, maybe half a dozen times, and just can't get into it, and then somehow the right confluence of attitude, time, and circumstance hits us and the piece finally connects. I had taken out Oryx and Crake from the library several times, read the first chapter, put it down, and returned it because I just hadn't felt the need to pick it back up before the due date. This time, though, determined to get through it just to say I'd done it, I instead got the audiobook from the library and listened to it while I was driving back and forth to work. I can say now, a week later after having devoured it and its companion novel The Year of the Flood, that virtually the only flaw of Oryx and Crake is the fact that that first chapter doesn't grab harder. Because, and I do not exaggerate, the remainder of the book was one of the half dozen most superb pieces of sci-fi/speculative fiction I've ever read. Game-changing-ly superb. Like when I read Orwell's 1984 or Jack London's The Iron Heel, I had that old familiar feeling that this was one of those books that would forever influence my work from that point forward. Where to even start with these books? Well, I guess the best place would be to describe what they are, for those who don't know. The storyline is one of eco-terrorism, global pandemic, capitalism-gone-totatitarianism, and finally the end of the world and what comes after, told from the point of view of half a dozen characters including the two young men who are central to the plot, their common friends, lovers, family members, and associated supporting characters. Oryx and Crake is primarily about the two men, Jimmy (Snowman) and Glenn (Crake) and their lifelong friendship that evolves from having grown up in the same corporate-controlled utopian compound. Both brilliant, both slightly outcasts, they end up weaving in and out of each other's lives through high school and college until they're both employed by mega-corporations themselves. Though their lives diverge, they remain friends until the end of the world, of which the actual event is the story's revelation/climax. Their shared intellectualism in the face of a world that seems bent on simply chugging ahead with the wasteful, soulless, destructive, image-obsessed status quo binds them together, as does their love for a mysterious girl named Oryx. 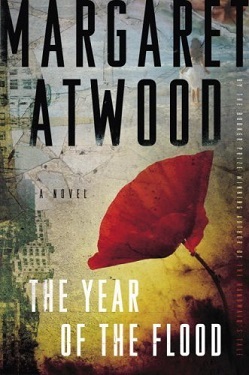 The Year of the Flood is a companion novel set in the same geographic region during the same timeframe as Oryx and Crake, but is told from the point of view of several of the supporting characters from the first novel, including some of Snowman and Crake's girlfriends, their underground resistance friends, and various other notable personalities only hinted at in Oryx and Crake. Of the two, Oryx and Crake is so flatly brilliant that it's my decided favorite, but The Year of the Flood was also excellent and in particular the ending was beautifully done. Without giving anything away, I will say that if you read Oryx and Crake, you've not really read the ending until you finish The Year of the Flood as well. With the two books, Atwood creates this marvelous double-crescendo ending sequence that turns what seems at the end of Oryx and Crake to be a Lord of the Flies-style non-ending into the pause before a more robust, fitting, and epic finale. I've had a few days to digest these books and give them some thought and I've settled on the fact that what really sets them apart from most of the post-apocalyptic fiction I've read is that even though the characters feel in very present, real peril at all times, the books ultimately are about how good friends are for the soul, and how they can make something unbearable bearable, and how even if the silly nonsense that we call "the world" fell apart, as long as there were humans left to make friends with, we'd more or less ok. That's not, of course, the plot of the story, but these books leave you with this distinct impression. Although the year isn't over yet, and I've got some terrific books on my reading list at the moment such as Samuel Delaney's Dhalgren, Larry Niven's Ringworld, and Neal Stephenson's Anathem, all of which have garnered high praise from people I respect, I'm going to call this the year of Oryx and Crake & The Year of the Flood. It's been about five years since I've read anything so haltingly brilliant and that beckoned so directly at my own work, and it would be a tall order to match that any time soon. Dhalgren, and Oryx and Crake are two of my three most loved books. I have just ordered Anathem and The Year of the Flood, so as your tastes appear similar to my own, I shall have to look into Ringworld. Thankyou, it is always a pleasure to discover a good author. We're covering Oryx and Crake this month (July, 2013) on www.forevermansbookclub.blogspot.com Each week we comment on one/fourth of the book - I just posted the first comment on the first quarter a few minutes ago. Feel free to chime in, or just check out the posts!